Printable word angles puzzle. 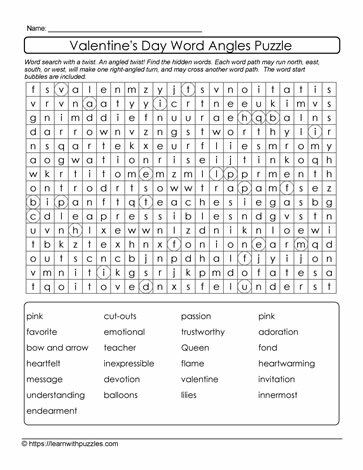 Here is a theme-based Valentine's Day wordsearch printable with a twist! Start bubbles are hints to support learners. Use them to locate words in the word bank. Highlight wordbank words to complete the wordsearch puzzle. Remember: each word has a right angle to its solution. Words can go horizontally, vertically, forwards and backwards. Puzzles engage students' vocabulary building skills, and activates problem solving strategies in all classrooms: digital, regular, Google, and the home schooling environment. Differentiate instruction to support English language learners. Puzzles also complement language curricular in elementary 3,4,5 grade classrooms.